History, including Bible history, may mention the sexual “adventures” of certain people, yet not say a word about the children thus conceived. Did you ever wonder about the children of the Samaritan woman (John 4)? She was at that point living with partner number six … However, God’s eye is on each one, and all of them are precious in his sight. As Jesus puts his arms around the children in Mark 10:16, does it matter to him whether one or two are “illegitimate”? His love is unconditional! Sometimes we get a glimpse into his purposes with such a one who was “accidentally” (and inconveniently) conceived. Take Jephtah in Judges. One even found his way into the Lord’s genealogy in Matthew 1, not to mention three of the five mothers who are also there. Lorival is one of millions in modern times. His colorful story of 36 years could fill volumes. We only have space for some glimpses. Then, just as he got a hold of the gun, the trigger was pulled and something snapped inside him. It was the bullet entering his abdomen and coming out at the back. It had narrowly missed his spine. Stumbling out the door, he didn’t really know where he was going. After one kilometer he collapsed. Somebody picked him up and took him to the nearest police post. The police took him to the local clinic, but there was no doctor on duty. An ambulance was called, and in the mean time some unknown Christian approached and prayed for him. The ambulance took him to another hospital far away. That night he got a ‘drip’, nothing else. Another ambulance took him on to another hospital the next day, this time 150 kms away, in the city of Oviedo. On arrival Lorival is unconscious, but at 3 pm he comes to. The pain is unbearable and he cannot help screaming. At last a doctor comes and a five hour operation follows. His insides are stitched back together again. Something, though, must have gone awry … The bleeding isn’t stopping, his life is ebbing away, and Lorival realizes it. There is still time to think though and his whole life passes before his eyes. His mother had him when she was still very young. Lorival never knew his father. A stepfather often beat him severely and at age seven he ran away, starting a life of wandering about, yet maintaining some contact with his mother. From his 10th till his 13th he lived with an elderly man, who truly cared, always giving him good advice. When this man was mugged and killed by a robber, Lorival took to the streets again, beginning now to travel, not only in his own country of Brazil, but also in Argentina and Paraguay. There, in Paraguay, he more or less settled when he was sixteen. Being small and light-weight got him a job as jockey for horse racing. But it was not the only job, in fact there were a multitude. He also got into lots of mischief. At the same time, however, he started to look for God. Yet the emotional and noisy scenes in the churches, where he had visited in Brazil, didn’t attract him; they rather put him off. Then, at 21, when he was working as a cowhand, he became very sick. In his misery he cried to God and promised to serve him. In his great loneliness he also asked for a wife. God granted both requests. When Lorival met this young lady, he did realize that she was not well and might not live long, but he loved her tenderly and they got married. However, whenever he tried to persuade her to accompany him to some Paraguayan Gospel church, she, being a staunch Roman Catholic, steadfastly refused. It meant he didn’t go either. And so the promise made to God receded into the background. Then his wife died. They had been married for a year and five months … He was all alone again. Saturnino, member of a new congregation in the city of Oviedo, has a heart that burns for the lost. He continually visits the local prison and the hospital. Those whose days are counted get special attention. How he prays they might at least hear the Gospel before they enter eternity. He sits by their beds, reads to them, explains the Good News, then prays for them. And God gives fruit. One heart after another opens to the Savior. Sins are wiped away and the patient departs in peace and joy. When 33 new Christians have been taken, Saturnino begins to ask the Lord for one who might live. Soon after, as he passes a hospital ward, God’s Spirit leads him to enter. It is the ward where Lorival is dying and getting very desperate, crying to God for someone to show him the way of salvation. Saturnino speaks to the seven patients in the ward, but, seemingly, doesn’t get anywhere. At last he leaves. Then, as he goes through the door, Lorival calls him back. 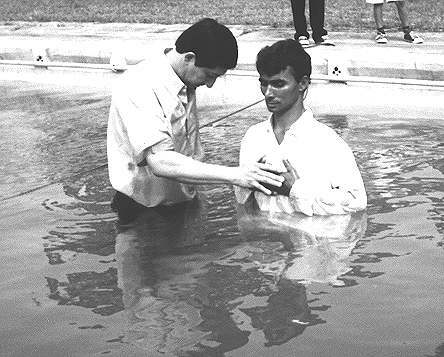 Lorival realizes it is now or never, and he receives Christ into his life! The dawn of a new day. But what about that prayer of Saturnino? Saturnino makes sure that others start to pray for Lorival, that he gets visited every day, and also that the huge sum for a second operation is raised. Because this time the doctors won’t operate if they don’t see money! The second operation is successful and Lorival is practically brought back from the grave. Five months later, when he has started to walk a bit, he travels to Santa Rosa to collect his things. He finds that he has been the talk of the town. All are convinced that he is dead. And what a fright some of them have when he appears to them, more alive than ever! “Yes, I died alright”, he tells them, “to this old world that is.” Since everybody knows what his past life was, with all the drunkenness and vice, they can only marvel at the miracle. Moreover he refuses to formally charge the guilty man, who, apart from being imprisoned, would have to pay him a fortune. Lorival has already forgiven him freely.